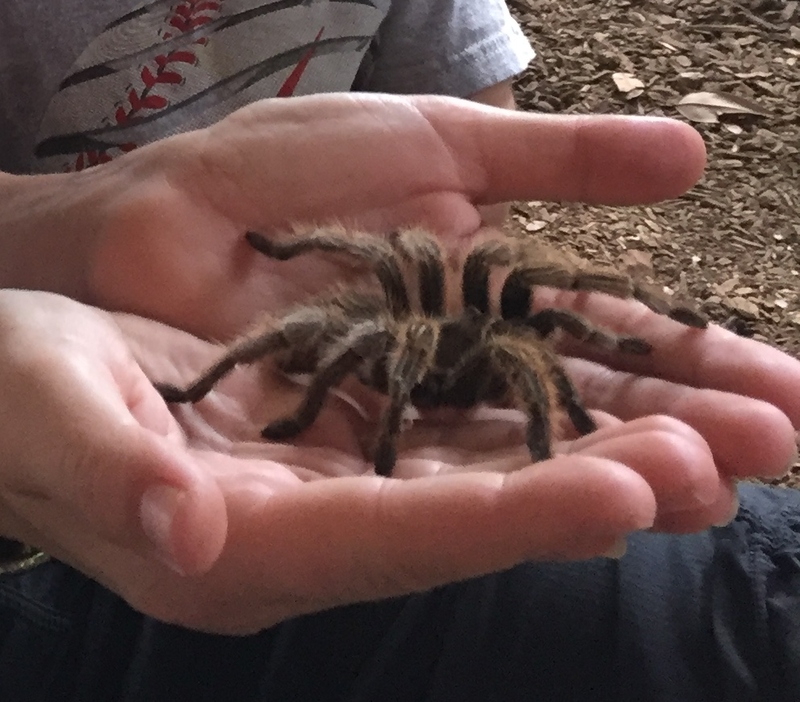 That’s me, holding a tarantula at a wildlife rescue center. I wasn’t always such a spider lover. In fact, I was afraid of them as a child and did my best to avoid them as an adult. But my current home seems to be a sanctuary for our eight-legged friends. For a long period of time, my bathroom housed three spiders. Instead of escorting them outside, as I usually do, I decided to keep them around. Exposure therapy*, a type of behavioral therapy, is based on the premise that if you’re afraid of something – even phobic – the best way to conquer your fear is to face it head on. Scared of flying? Book frequent air travel. Afraid of talking to strangers? Set up situations in which you do just that. Wary of spiders? Shower with them daily. As time progresses, with exposure to the feared stimuli (in my case, spiders), the fear diminishes. If it’s too overwhelming to face the fear at first, baby steps might work – setting up some gradual exposures (e.g., inching toward the spider in progressive amounts) and noticing what happens with the fear over time. And it worked. After some time, I wasn’t eyeballing them each time I entered my bathroom or inching away from their frequent web descents. When one spider went missing, I worried for its safety. And then a few months later, I had the opportunity to hold the spideriest of spiders, a tarantula. I wasn’t exactly at ease holding my fuzzy friend – and I certainly wouldn’t want this one living with me – but my close encounter with this hairy creature was made 100% possible by exposure work. *Gatewell Therapy Center offers exposure therapy for various phobias, OCD, social anxiety disorder, eating disorders, and other related conditions. Contact us to learn more about this treatment.